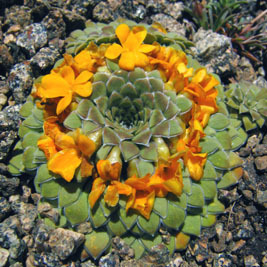 The rosulate violas, which have typical 'heartsease' flowers but leaves arranged in a rosette rather like a sempervivum, are a specialty of the Andes mountains in South America. Not much has been written about them, and most of the information here is from the Encyclopaedia of Alpines, John Watson's article in the Bulletin (September 1994), and John and Hilary Birks web page which is a detailed account of the 2005 AGS Expedition which they led to Patagonia. We saw a good number of species on that journey, and the pictures here were taken on it. 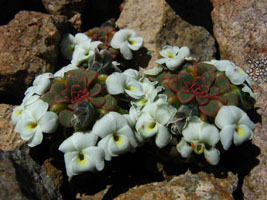 Viola sacculus was the first we saw, on Cerro la Hoya (see map). 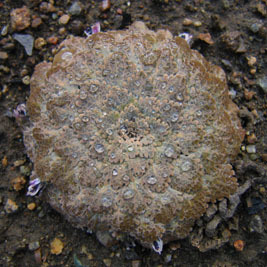 The surprise was how small it is, perhaps an inch across a rosette, but very beautiful in extreme closeup with clear bluish-white petals and a reddish rim to the leaves, which is characteristic. 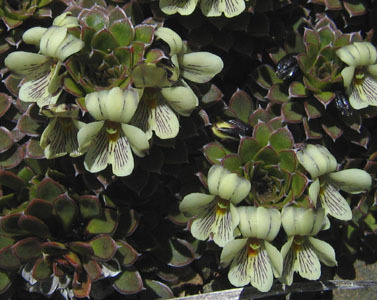 Many of the violas are found locally, even confined to one mountain, but Viola cotyledon is the commonest and has a wide geographical spread. We saw it in a number of areas; the picture on the right was taken on Volcan Batua Mahuida, looking west to the volcanoes on the Chilean border. 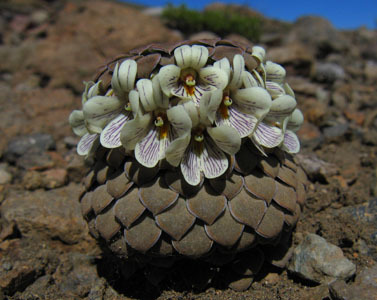 In contrast, Viola coronifera, (left), is confined to the 6000' mountain Cerro Colo Huincul and its immediate surroundings. Although there are several yellow rosulate violas, this is the only one which we saw. It was discovered just a few years ago, and probably has been seen in the wild by only about 100 people, including the 18 in our expedition. 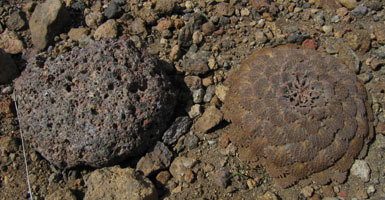 Viola vulcanica disguises itself to look like a piece of the local volcanic rock - see the picture on the right - is this because birds fancy it ? 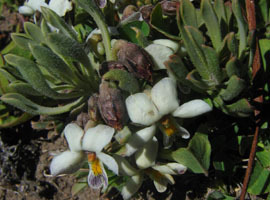 Its flowers are unspectacular, too, though in the plant on the left they are still just emerging. 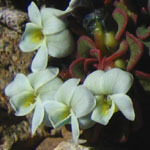 Both Viola columnaris (left) and Viola dasyphylla (right) are classified in Watson's paper as belonging to the cotyledon group, though in these pictures their habit is different, and it is easy to see how V. columnaris gets its name. Finally, one that (nearly) got away. In John Watson's 1994 account, he describes it as 'elusively rare and very local', and says that no-one has seen it since its original discovery by Comber. It has of course now been located again, but the Birks were very happy to be able to locate it again this year. Rosulate violas have been grown in captivity, and appeared on the show bench. We haven't tried, but they are and will be a worthy challenge for anyone now and in the future.